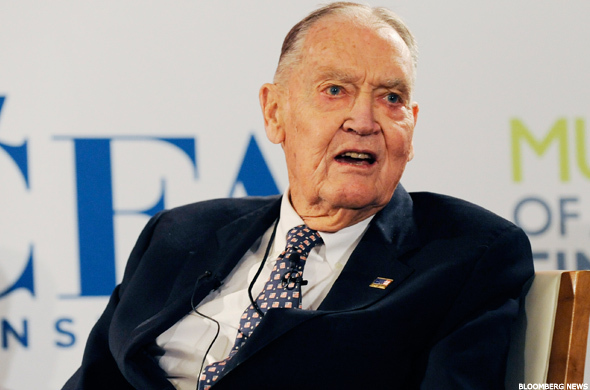 Jack Bogle dealt out investing ideas and warnings in an investor talk. Here's what he had to say. PHILADELPHIA (TheStreet) -- About 250 avid fans of John Bogle -- Vanguard's founder and retired CEO -- gathered at the Bogleheads' annual meeting outside Philadelphia on Thursday to listen to "Saint Jack" talk about how to invest, what the market's gyrations mean and how to establish their own financial freedom. Bogle seemed delighted to be there, describing his work as "striving to build a better world for investors -- not just Vanguard investors -- who deserve a fair shake." He gave an informal talk and a formal presentation, delivered confidently and met with frequent laughs from his mainly gray-haired fans. "We all know the world is going to hell in a hand basket, but we don't know what to do about it," Bogle said wryly. In fact, he had many ideas about how investors should manage their money and what they should do in these volatile times. There are some serious problems in the investing world now, Bogle said. Geopolitical risks like Middle Eastern terrorism, a slowing economy in China and weakness in Europe all look ominous. Bogle added that excessive executive compensation, slipshod accounting practices and undisclosed political contributions are dangers in the U.S. market. He also sees "excessive rent-seeking, even rent-gouging," by many in the financial system. In his view, some investing issues are "white and black, right and wrong" and there's no compromise. One of those issues is management fees, which Bogle wants to limit. And he called for a new fiduciary standard for all who are in charge of other people's money. Corporate profits drive market growth, Bogle explained. In a chart, he showed how U.S. corporate profits were hitting a high of 10.5% on average, the most since 1930. But 6% to 8% profits were much more typical. Bogle explained that these profit figures could possibly mask trouble in companies, such as underfunded pensions, accounting tricks or bad treatment of workers. There's a risk that corporate profits may revert down to historical levels. "This is a risky world we live in, and I don't know what to do about it except keep a reasonable conservative position," Bogle said. That means a balanced approach to owning both stocks and bonds, he said. "When I start to panic I just read one of my books," he joked. Warren Buffett has become Vanguard's best salesman, Bogle said. Buffett, of Berkshire Hathaway (BRK.A - Get Report) , (BRK.B - Get Report) recently announced that his wife will inherit money to be allocated 90% to the Vanguard 500 Index Fund (VFINX - Get Report) (VFIAX - Get Report) (VOO - Get Report) . After the announcement, searches on Google for the 500 Index went haywire. Fund inflows in 2013 were $645 million; in 2014 they are $2.86 billion. It's "a wonderful tribute," Bogle said. But he also noted that he suspected some annoyance from the corner office: "Dear Bogle, you jerk! You're now Vanguard's second-best salesman" -- since now Buffett's the best. Though he has attracted many fans among mutual fund shareholders, Bogle has earned the ire of competing mutual fund companies. "I love the joy of the battle," he said. He attributed his stubborn advocacy for lower fees and greater investor protections to "my growing idealism, which is still unshakeable." The volatile daily changes in the stock market are merely "a tale told by an idiot" and should be ignored. Instead, "fundamental value, not speculative return, carries the day in the long term," he said. Bogle's long crusade against mutual fund fees clearly continues. He complained that "we eat up all of our dividends with stock expenses" because fund managers take 63% of dividend income in fees. He cited figures that gross yield on domestic mutual funds is 1.9%, but the average expense ratio of a mutual fund is 1.2%. That leaves a mere 0.7% in net yield. He described this as a huge problem "in an industry you could easily say doesn't give a damn." His view seems to be gaining converts. Bogle showed a chart of fund inflows. From January 2006 through September 2014, $809 billion has gone into index funds and $555 billion has come out of active mutual funds. Index funds, he said, "are never very good and never very bad." He went on, "With the index, you capture your fair share," avoiding manager fees, cash drag and transaction costs. Active investors are "slitting their own throats" in fees, he said. Bogle opted to describe Bill Gross, the now-departed Pimco manager and an active bond trader, as "one of the true legends in this industry." To sum up his views, Bogle told the group to "own the stock market and hold it forever." Already retired once from Vanguard, Bogle still works every day with the help of three assistants. But he has no inclination to slow down. He's no longer working for the money. Anyway, as he joked about Vanguard's global asset base, "What's $3 trillion to someone who's written a book called Enough?" Bogle recounted how a journalist called him and asked, "Who are the other mutual fund managers you admire?" Bogle paused for a long time. "Are you still there?" the journalist said after a minute. That long pause is the answer. No one has stepped up to take his place as a mutual-fund-shareholder advocate. So even at 85, he plans to continue. "The spirit is more willing than ever," he remarked. Besides, he said, "How could life possibly be more rewarding?"